Coloring mandalas is fun and the result is always spectacular. 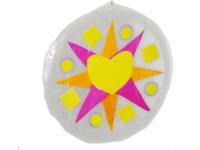 Make sure children have seen mandalas before trying this craft so they have an idea of what they look like. 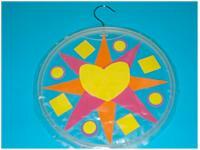 When I thought of this craft, I wanted to let children use shapes to create mandalas of their own. This is really pretty when hung in a window too! 1. Gather your materials. 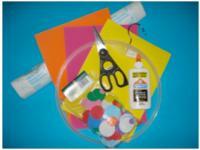 You will need fun foam sheets or pre-cut shapes, contact paper, a circular hanger (or other round frame), white glue, scissors, and ribbon. 2. Cut two squares of contact paper. They should be just a little bigger than your circular hanger or frame. 3. If you are not using pre-cut fun foam shapes, cut several different sizes of triangles, squares, rectangles, and circles out of the fun foam sheets. Of course, don't miss the opportunity to practice shape and color recognition! 4. Peel the back of one of the squares of contact paper. 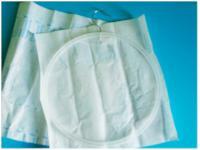 Deposit the circular hanger on top and press. 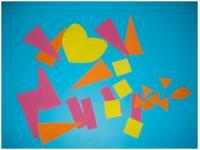 Begin pressing shapes onto the contact paper. 5. Continue adding shapes until the circle is almost full. Peel the back off the second square of contact paper and press it on top of your mandala design. Cut any excess contact paper. 6. Add ribbon. 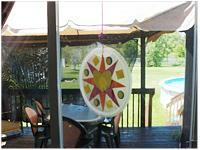 Children will be proud to hang their mandala in a window or in their bedroom!